Bar Jiggers | What is a Jigger? What is a Jigger / Bar Jigger Anyway? A jigger or bar jigger is an hourglass-shaped measuring device used by bartenders to ensure that they pour accurate amounts of alcohol into every drink. Usually made of metal (and sometimes plastic), jiggers contain two different measuring amounts – one on either side of the hourglass. A jigger of alcohol refers to 1.5 ounces (approximately 44 ml) and the bar jigger was named after the measurement. 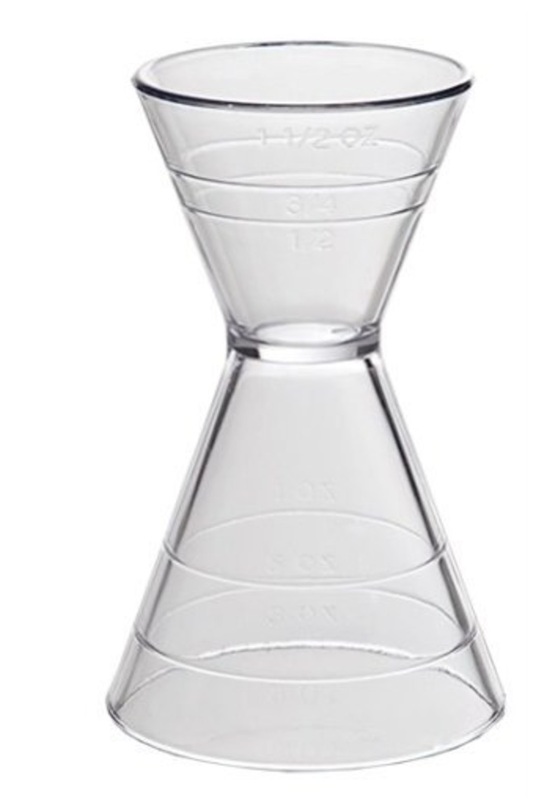 The standard jigger measures 1.5 ounces on one side of the hourglass and 1 ounce on the other side. Now, however, you can buy jiggers in a variety of different measuring amounts – from 0.5oz / 1oz all the way to 1.5oz / 2oz and also in metric sizes (that means, like, millilitres). On the typical 1 x 1.5 ounces, the 1 ounce side is called a pony shot and the 1.5 ounce side is called a fluid jigger or jigger shot. 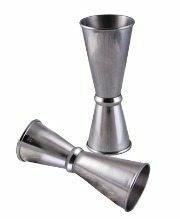 Although the jigger pictured above is the standard and the most common you’ll see in bars across the world, it’s obviously not the only jigger you can buy. Below is a variety of different types of jiggers – plastic, tall, collapsable, and even a jigger cube for when you want more than just 2 measurements on hand. This is the best-selling jigger on Amazon and also the highest rated. Likely because it adds those simple little features that every bartender wants in a jigger including a non-slip grip and incremental measurements on both sides. Throw in the fact that it’s dishwasher safe and you’ll understand why it’s rated 5 stars on Amazon. 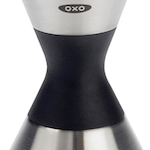 The Oxo jigger measures 1 oz on one side and 1.5 oz on the opposite end. This stainless steel tall endurance jigger has measurements of 56ml (2 oz) on one side and 28ml (1 oz) on the opposite side. It has a mirrored finish and a rounded lip for that extra touch of class. 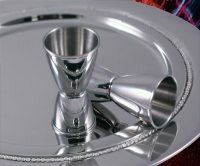 Instead of being stuck with only two measurements, this multi-level jigger has ridges marking 0.5 oz all the way up to 2.5 oz. Because of the ridges, it’s easy to see how much alcohol is being measured out…if you’re looking at it from the outside…which we bartenders don’t. So, that being said, this jigger is not the ideal choice for a busy pub or nightclub. If you have a home bar, you might not mind the fact that it’s difficult to determine how much liquor you have in your jigger. As a business, however, this information is essential. For this reason, this jigger is not recommended for professional bartenders. These ones are made from high-quality plastic and great because you can see right through them to easily figure out how much alcohol you’ve poured. This pour spout comes with a cap that pops off, doubling as a 1 oz measuring device. And, if your bar has problems with fruit flies or other bugs that find their way into your alcohol bottles, these are the perfect solution. 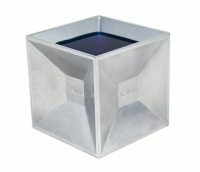 This cool aluminum alcohol measuring device is cube-shaped and each of its six sides has a different measurement. Pouring from 0.5oz all the way to 2.25 oz, this jigger cube allows bartenders to measure multiple measurements without changing bartending tools. When you buy the Jigger Cube through our bar store, the package also includes a recipe book containing 14 of the top cocktails. Hey there! 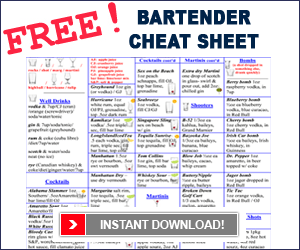 Reese Richards here from Barsandbartending.com. Today’s video is very quick and easy. It is “What is a Jigger?”, Jigger, J-I-G-G-E-R. A jigger is a measuring device, bartender’s measuring device. So it looks like an hourglass, usually they are metal and they have two different measurements in each side. So for this particular one, the standard one, comes with one ounce on one side and one a half ounce on the other side. You can get anything from a half ounce to an ounce, all they way up to one and a half ounces and two ounces. This is a standard sized jigger and this is the measuring device bartenders use. So, you can use a shot glass but some of the shot glass made by different companies come in different sizes, but you can be sure with a jigger, you’re always getting the right size. Okay so an hour glass shaped, metal is best, has two different sizes – standard one ounce on the other size and one a half ounces on the other side. Okay, this is “What is a Jigger?”, my name is Reese Richards.